(Text automatically translated) A cottage autentique Savoyard comfortable, very warm, tastefully decorated, awaits you. The Attic Chalmont the 18th century and has been completely renovated. At 1100 meters, a large terrace of 50 sqm in quiet and south, offers a panoramic and breathtaking view of the mountains of the Spinner. Ideal for a family of 4 to 5 people for a holiday full of relaxation, calm and rest. Beautiful situation and charming chalet with wonderful views of the mountains. Very friendly and helpful hosts. We loved it! The chalet is approached up a single track road about 2km from the village of Manigod. The views from the property are truly amazing and it is very peacefully situated. Inside the property is small but well fitted out though some wardrobe space would have been useful in the main bedroom. But as we were there as a couple it wasn't a major issue as we could use the bunk bedroom. Access on either side of the double bed however is extremely limited. The main living/kitchen area is very comfortable and the big windows give plenty of light and make the most of the views. The large terrace is a lovely place to sit and relax as well as being able to dine outside looking at the mountains. Our main dislike was having the bathroom downstairs opening directly into the living room which was not ideal. There was some noise disturbance while we were there as the owners plan to build a large cabin next to the current one and drilling work had started for the initial groundwork. It is unclear when the work is due to start fully. The village is very quiet and everywhere was closed when we stayed there apart from the bakery. The nearest shops etc are about 6 km away and easily reached by car which is essential in this area. We really enjoyed our stay and the highlight of the property has to be the view. It was a lovely small chalet for a family. Our kids enjoyed spending time in manigod. The view was amazing. Easy to drive to ski resorts and annecy. 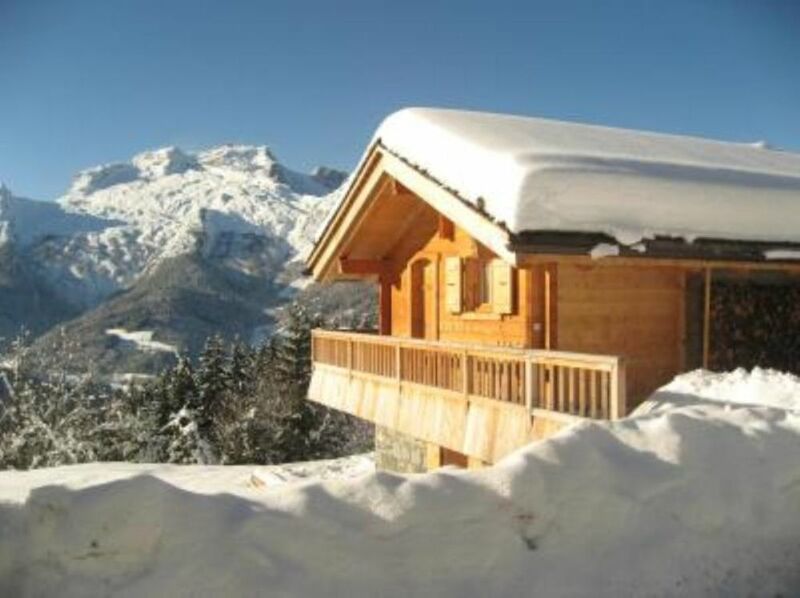 Owner was veri helpful and they were a lovely family..
"A beautiful little chalet in a very quiet tranquil location. All we could hear was the sound of cowbells! The view from the terrace was amazing across the mountains. The chalet itself was spotless with everything you could ask for - a real home from home. Lots of wildlife too. Wild boar at night, lizards darting about during the day and eagles flying about. Despite it''s relatively remote location, it was only a short drive to the bakery in Manigod for breakfast pastries and there was also a small supermarket and a bar. Even better, it was only about 25 minutes to La Clusaz and Annecy. We had a wonderful holiday - the owners were very welcoming. They do not speak English so you need to know enough French to get by!" "A simple but very comfortable and clean chalet. You feel at home immediately! The view is wonderful and the location very peacefull. The owners, which we only saw the day of arrival and departure, gave us a warm and very friendly impression." "We had an excellent time in the chalet of the de Oliveiras in Manigod. The chalet itself was beautiful, spotlessly clean with a high degree of finish and was very comfortable with all modern conveniences. The setting was stunning overlooking the massif des Aravis with lots of local amenities a short car ride away in Thones. I would recommend this rental without hesitation." (Text automatically translated) regional market, fairs, museums, seasonal entertainment, farm visit will be to plan your activities. You retouverez the famous local specialties (tartiflette. ..) in many restore Valley Thones. Documentation and guidance owners will be there to help you have a pleasant and memorable stay.